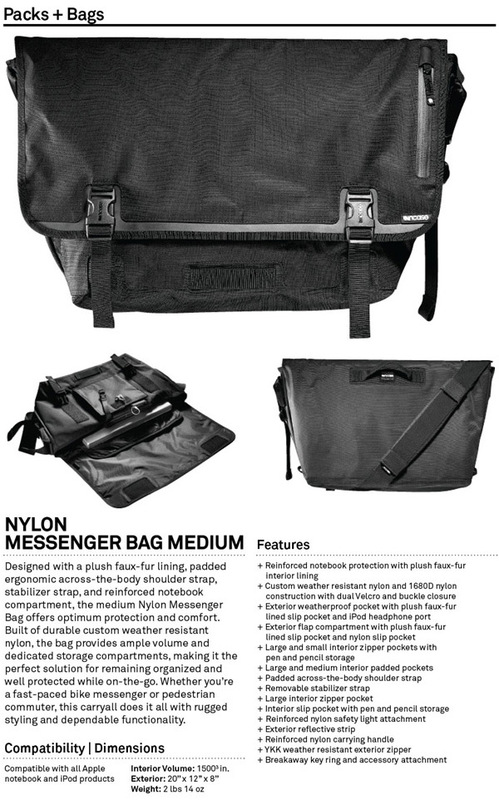 Flipping through the 2008 Incase catalog, these new Nylon Messenger Bags jumped out at me, and upon reading the details (see the catalog pages after the jump) i had to post it out of curiosity and intrigue. In two sizes (medium and large), both have a sleek yet textured look, weather resistant nylon and waterproofed lining, exterior weatherproof pocket and headphone port, topographic print lining, and i like how the edge goes up and around the clips… as well as a mysterious “plush faux-fur lining” (i wonder what that looks/feels like) to protect your goods. In the large model, there is even a removable notebook sleeve, removable hipsack (fanny pack? ), interior bike pump tie down, and an “abrasion resistant skateboard attachment with molded skate bumpers”. See more details and images after the jump! 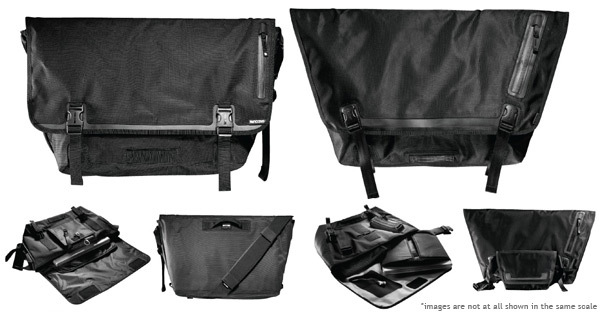 It isn’t easy finding a good subtle, rugged, stylish, black messenger bag. I’ve got quite the stash of them (from chrome to ordning & reda to random leather ones to timbuk2 to patagonia…), but it’s been a while one has even really caught my attention. Hi they are the best ones ever seen. 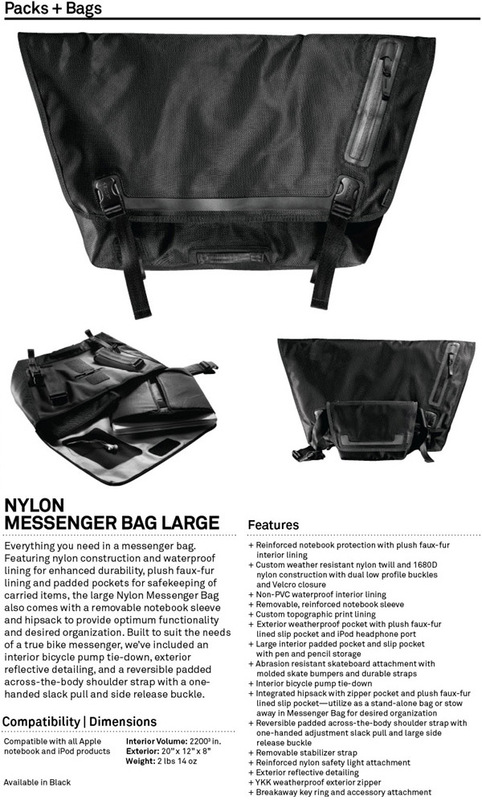 where can I buy the right one (Nylon messenger bag Large)? Please anyone let me know the websites selling that bag!!! Any word on this bag yet? Looked everywhere…. where can you get an incase catalogue? i’ve never seen one. I can only hope they are out soon. This is exactly what I’m looking for, but if it is just as much as a chrome or timbuk2 bag, I’m out. I’ll just get a real messenger bag for that price. ©huck ~ i don’t think they are available yet ~ part of the 2008 line though ~ so should be out soon? i hope? another really cool messenger back to check out is by a company called zwei, the website is iam2.com (zwei flipped over). the company is in Germany. Make sure and check out all the functions in the video on the site, they have an attachment that hooks them to the front of your bike.